Market share attraction models are useful tools for analyzing competitive structures. The models can be used to infer cross-effects of marketing-mix variables, but also the own effects can be adequately estimated while conditioning on competitive reactions. Important features of attraction models are that they incorporate that market shares sum to unity and that the market shares of individual brands are in between 0 and 1. Next to analyzing competitive structures, attraction models are also often considered for forecasting market shares. The econometric analysis of the market share attraction model has not received much attention. Topics as specification, diagnostics, estimation and forecasting have not been thoroughly discussed in the academic marketing literature. In this chapter we go through a range of these topics, and, along the lines, we indicate that there are ample opportunities to improve upon present-day practice. Rights Copyright 2001, d. Fok, P.H.B.F. 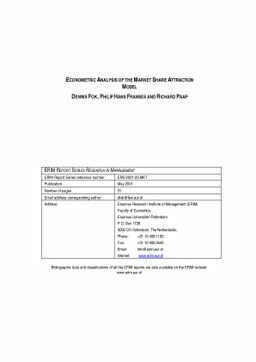 Franses, R. Paap, This report in the ERIM Report Series Research in Management is intended as a means to communicate the results of recent research to academic colleagues and other interested parties. All reports are considered as preliminary and subject to possibly major revisions. This applies equally to opinions expressed, theories developed, and data used. Therefore, comments and suggestions are welcome and should be directed to the authors.